This how-to contains a step by step description about the initial setup of a Raspberry PI using the Raspbian OS until it is accessible via SSH console and screen/keyboard can be disconnected. Check all your hardware with the compatibility list! Current version of the Raspbian image. Can be downloaded here. Tool to write the image file to the SD card. On the first boot the configuration tool will open. Execute this command to use all available space on the SD-card. 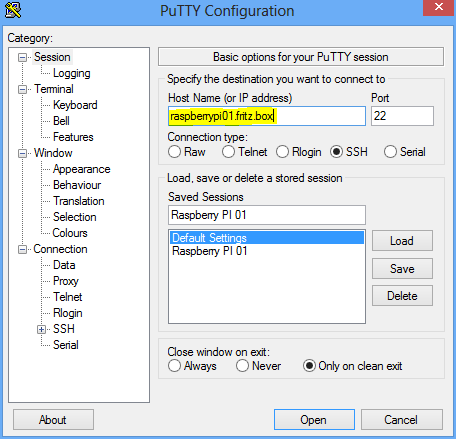 With this command it is possible to change the default password “raspberry” of the user “pi”. If the Raspberry PI will be used for test purposes only it is OK to keep the default password. But if the Raspberry PI is used e.g. as a web cam server it is highly recommended to change the password so that nobody else can access the data on it. Possibility to select the timezone where the Raspberry PI is located (e.g. Europe - Berlin). Possibility to select the keyboard layout and the keyboard language. Hint: On the first view only English can be selected. All other languages are available by selecting the menu item “Other”. By default the hostname is “raspberrypi”. It makes sense to give it another name, especially when you want to use several Raspberry PIs in the future. It is important to activate SSH. This makes it possible to disconnect the screen later and have access to the Raspberry PI with a SSH client like PuTTY. Finally it is important to setup a network connection via LAN or WLAN so that the remote access via SSH is possible. A very good SSH client is PuTTY. Just type in the hostname (or IP address) and click on “Open”. Type in the login name (“pi”) and the password. If this screen is visible everything went fine. Now the screen and keyboard can the disconnected and the Raspberry PI is ready for its desitiny.